Record Rack: A round-up of the week’s new albums, expanded reissues and/or box sets, appearing each Monday on Slicing Up Eyeballs. All releases due out this Friday unless noted. This week’s releases include new and reissued titles from Dead Can Dance, Yazoo, OMD and The Art of Noise. Dead Can Dance — led by co-founders and mainstays Brendan Perry and Lisa Gerrard — today offered up the first taste of their upcoming ninth studio Dionysus in the form of “The Mountain,” the opening of the forthcoming record’s second act. Stream the full track right here. The enigmatic Dead Can Dance — led by co-founders and mainstays Brendan Perry and Lisa Gerrard — today announced the release for their ninth studio album, a song cycle of “seven movements representing different facets of the Dionysus myth and his cult.” The group also announced a European tour for spring 2019. The enigmatic Dead Can Dance — led by co-founders and mainstays Brendan Perry and Lisa Gerrard — have recorded a new studio album, the group’s second since reuniting in 2011 and the first to be released in six years, Perry revealed in a tweet on Saturday. It’s not yet known when the album will be released. Barcelona’s Primavera Sound 2013 festival is underway now, and the organizers have launched a live webcast of some of this weekend’s performances, including sets by The Jesus and Mary Chain, Dead Can Dance, Swans and Dinosaur Jr, as well as Phoenix, Hot Chip and Grizzly Bear. The reunited Dead Can Dance was one of the last acts to perform on Sunday night to close the first weekend of the Coachella Valley Music & Arts Festival, performing an 11 p.m. set in what seemed like a windstorm. If you missed the official webcast, you can now watch the full 55-minute performance. In our latest round-up of links, we offer up a 50-minute webcast of Depeche Mode’s album-launch concert in Vienna last month, full streams of new albums from Echo & The Bunnymen’s Ian McCulloch and Dead Can Dance, plus news of a high honor for Kate Bush. Like New Order, the reunited Dead Can Dance is using its twin appearances at the Coachella Valley Music & Arts Festival this April as an occasion to squeeze in a couple extra performances — in this case, just-announced shows in San Francisco and Napa, Calif., the week between the band’s festival dates. 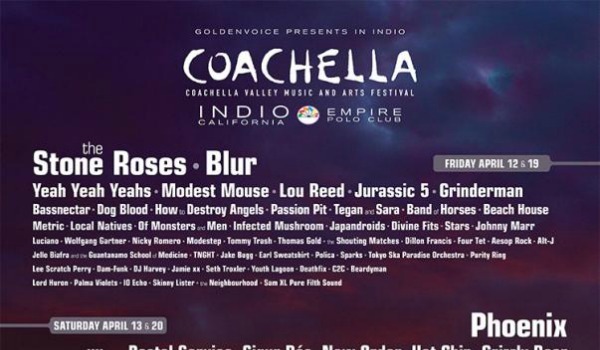 The original lineup of The Stone Roses will makes its U.S. debut at April’s Coachella Valley Music and Arts Festival, joining headliners Blur, Phoenix and the Red Hot Chili Peppers, plus a bill that also includes New Order, OMD, both Nick Cave & The Bad Seeds and Grinderman, Johnny Marr and more.